We propose a new adaption of linear Hermite subdivision schemes to the manifold setting. Our construction is intrinsic, as it is based solely on geodesics and on the parallel transport operator of the manifold. The resulting nonlinear Hermite subdivision schemes are analyzed with respect to convergence and C 1 smoothness. Similar to previous work on manifold-valued subdivision, this analysis is carried out by proving that a so-called proximity condition is fulfilled. This condition allows to conclude convergence and smoothness properties of the manifold-valued scheme from its linear counterpart, provided that the input data are dense enough. Therefore the main part of this paper is concerned with showing that our nonlinear Hermite scheme is “close enough”, i.e., in proximity, to the linear scheme it is derived from. 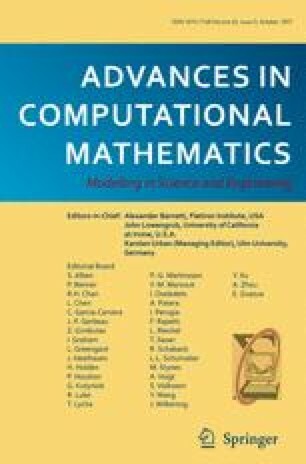 The author gratefully acknowledges support by the doctoral program “Discrete Mathematics”, funded by the Austrian Science Fund FWF under grant agreement W1230. Open access funding provided by Graz University of Technology. The author would like to thank Johannes Wallner for helpful discussions on earlier versions of this paper and gratefully acknowledges the suggestions of the anonymous reviewers.